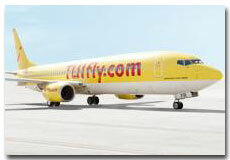 TUIfly is a low cost airline of Germany with its main base at Hannover Airport in Langenhagen, Lower Saxony. TUIfly Airlines is being operated and managed with the cooperation of Hapag-Lloyd Flug and Hapag-Lloyd Express. TUIfly provides air flight services to many domestic and international destinations. It also operates charter flight services for many countries. It is third largest air flight operator of Germany. You can easily book TUIfly flight ticket reservations online here. Flights schedule is updated regularly for the convenience of travelers. Get cheap flight tickets for TUIfly airlines online now. TUIfly was founded in 2007 by Hapag-Lloyd Flug and Hapag-Lloyd Express. They always offer excellent on-board flight services as a part of buy on board program an all flights. Snacks and drinks are offered on short routes. Hot meals are also served on long distance flights.